Breakfast is the most important meal of the day, and in my world, it's also my favorite. I eat the same two or three breakfasts on heavy rotation: toasted Flatout wrap with Krema and a banana, Chobani with fruit or oatmeal with different add ins. 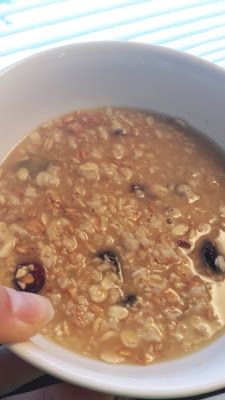 Oatmeal is one of my favorite foods and a frequent guest in my baking repertoire (as is evidence by my growing oatmeal recipe collection). I mean, it's heart-healthy, filling, delicious, gluten-free and versatile. What's not to love? 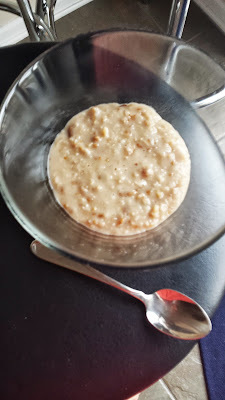 Although I often use my mini slow cooker to make crock pot steel cut oats or throw some oats in an empty peanut butter jar for overnight oats in a jar, I'm all about trying something new. MyOatmeal.com is a service that allows users to customize their breakfast blends by selecting a base, then adding in flavors, dried fruits, nuts and sweeteners. 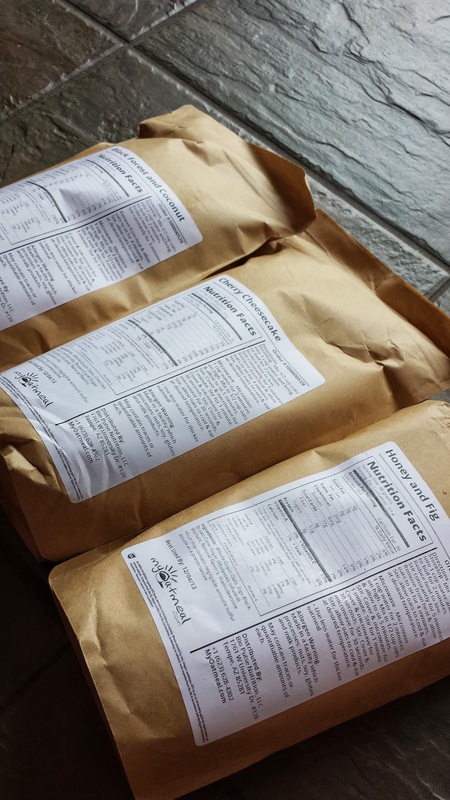 Each bag is made to your exact specifications and shipped to you in a jif. Owner Anthony hooked me up with a sample and I created three custom blends to try. I tried both the smash blend and the 5-grain rolled oats base, then started adding all the extras. There are 22 million possible combinations, so it's easy to get carried away. I had a hard time choosing, since I wanted to try them all. Peanut butter oats? Yes, please. Ultimately, I went with three custom blends: honey and fig with walnuts, cherry and cranberry cheesecake and German chocolate with shaved coconut. The package arrive two days later in the mail and the sampling began. Each package has the nutrition facts, ingredients and instructions. I tried the honey and fig first and was surprised that the walnuts really held up through the cooking process. The signature smash blend also cooked up to a delicious porridge consistency that kept me full. Next, German chocolate with coconut. The chocolate was subtle and the shaved coconut was very fragrant when cooked. My hands-down favorite is the cherry/cranberry cheesecake combo I created. Anthony told me he adored the dried cherries, so I took his word for it and tried them. They are the bomb. Coupled with the smash blend, it's the perfect meal. You get the tart cherries, the creamy texture from the cheesecake flavoring and the nice bite of the oats. I heart it. If you want to start making your own healthy oatmeal creations, I have just the opportunity for you. 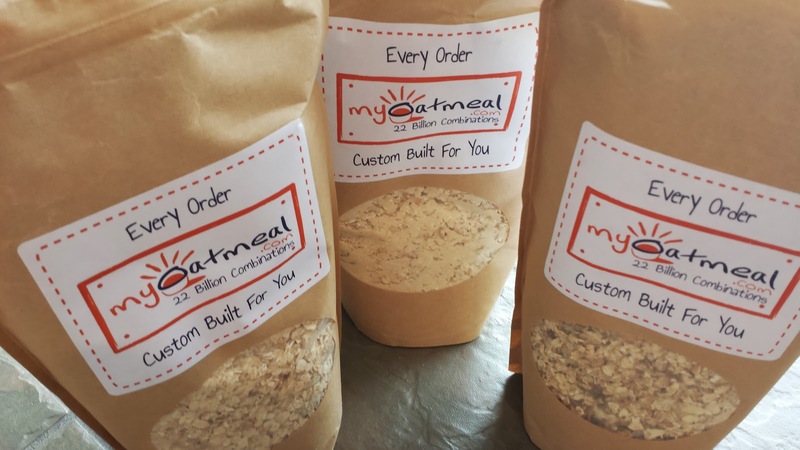 One lucky reader will win a free bag of customized oatmeal with free shipping valued at $20. This contest will close at midnight next Wednesday and will be run by RaffleCopter. Mandatory: Go to MyOatmeal.com and leave a comment on this post about the combination you'd like to try. This is such a cool idea! I'd love to make my own custom oatmeal! This is such a cool idea! I'd love to make my own oatmeal! I would make a Smores style oatmeal! I'd make banana cream pie with banana chips. Anything pumpkin or apple pie for me, please! I like your fig idea so I might try a fig orange combo! How awesome! I would want to make something dessert like-too! Key lime pie with chipped coconut and sliced almonds. My boyfriend would ask me to marry him already if I served this as breakfast! I would make Cinnamon Roll or Cookie Dough! YUM! I'd make dulce de leche with apples added in. HELLO Caramel apple oatmeal! cinn roll all the way..
btw..V wanted some dried blueberries from Costco and ate some and won't eat the rest. Any suggestions on how not to waste them? or do you want them? That looks so tasty! I'd have to go with something sweet sounding like cake batter with pecans--sounds like a pecan pie to me! YUM! I'd start with 5 Grain Rolled Oats & Flax and add cinnamon roll flavor with dark raisins and pecans. I have been dying to try so mant of these flavors! That cheesecake option sounds amazing - maybe I can convince the boyfriend to actually eat oatmeal if it tastes like cheesecake!!! Wow what to put in the oatmeal? Cranberry and chocolate maybe?!! I'd go with the oatmeal cookie flavor and add coconut and cherries. Yumm! I'd try the oatmeal cookie flavor and add coconut and cherries! Yumm! 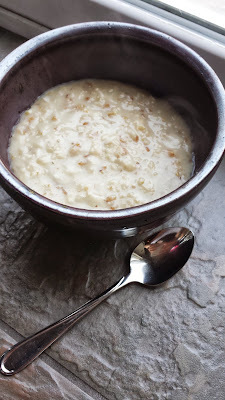 Gotta go with the 5-grain rolled oats, Horchata flavor with chipped coconut and sliced almonds! Brwon Sugar with apples, banana chips and strawberries! I'd like to try the signature smash blend ... in all the flavors.